You don’t have to miss out on Catholic family fun this summer, just because you are busy mompreneur. Successful Catholic mompreneurs know how to “be” with their families. They can cut loose when not working, which allows them to pour on the creative and energy into their work when it’s time to get to business. The art of balancing work and play distinguishes happy, revenue generating mom business owner from one who’s burned out, overwhelmed, pulled everywhere and feeling successful no where. Biz moms want the business, but they most importantly want to bond with their kids and raise solid Catholics and great citizens both on earth and in heaven. Sarah came up with kid-engaging play ideas easy to find and implement in this dot-to-dot Catholic fun manual. She cross-categorizes the activities by cost, time duration, and prep time. At a glance you can pick out what you have the time and money for and plug it into your schedule and know your kids will get quality play time with you. Keep Sarah’s book in the kitchen for easy access. It can become your go-to resource for getting out of the entertainment rut. The first pass through the book the “Be Crazy” caught my eye for a simple unexpected silly treat for my kids. “Be Crazy” simply go out and run around as a family uninhibited. Sarah provides a number of variations to keep things fresh. 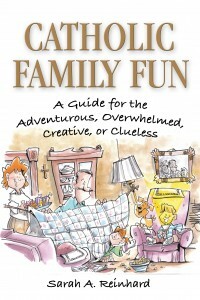 It’s easy to get distracted with work and neglect the needs of your family for playfulness and spontaneity. It’s also easy to do the same entertainment that may or may not be satisfying or properly feeding the mind and soul of your family.